I know that us Midwestern folk say this at some point every single winter, but we quite literally are living in a frozen tundra. Pretty sure I saw an article that we’re experiencing temperatures colder than Antarctica. Plus the foot and then some of snow that was dumped on us earlier in the week. It’s a hell of a time to be alive, I tell you! Anyway, that was a roundabout way of me trying to tell you that I’ve had some extra time on my hands. Aka I haven’t been able to leave the house much, so what’s left to do after work and house chores are finished? Online shop, of course! I had a Loft gift card burning a hole in my purse from Christmas, so I took advantage of one of their recent half-off online sales and free shipping days. I always love and appreciate some old-fashioned, no fuss mirror selfie try-on sessions so that’s exactly what I’m bringing you today. For reference – I’m 5’7″ and 143 pounds. 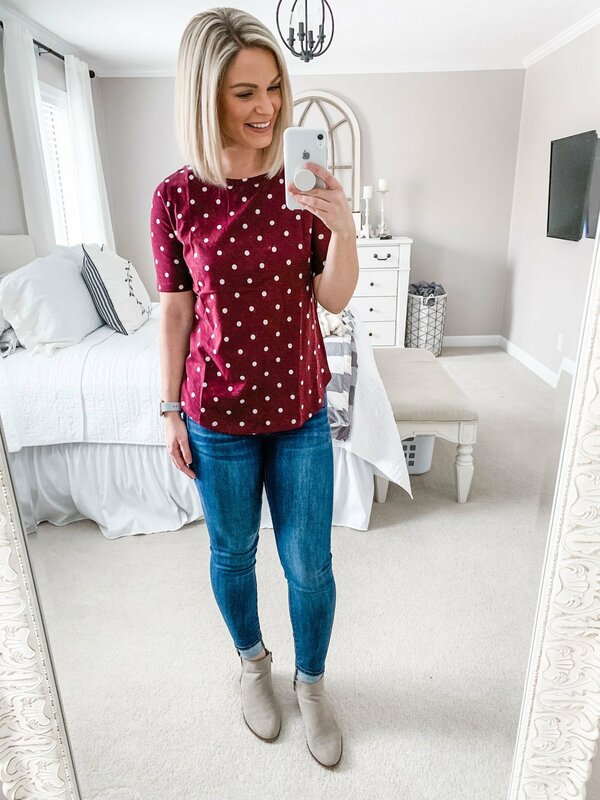 I typically wear a small or medium in tops from Loft, and nobody is as surprised as me that everything I ordered worked out! For me, Loft can be very hit or miss. I made a pact with myself at the beginning of the year to introduce more color into my closet. This muted coral exactly fits the bill! This was the top that I was most excited for, and it doesn’t disappoint. The comfy, lightweight sweatshirt material makes it perfect to wear now and into spring/early summer. I might’ve been able to size down to a small, but I’ll probably stick with the medium for length. I don’t mind a little extra room elsewhere. My jeans (size 4) and earrings are new, too! A new striped tee was long overdue in my drawer, so bonus that this one has the extra button detail on the sleeves. Perfect to wear casually (duh) or layered for something more polished. The material is a little on the thinner side, so take care of how you wash it to avoid any holes/extend the life-of-wear. Shirttail tees are not typically my favorite, but this one works. I think because it’s on the longer side, and I LOVE the elbow-length sleeves. I’m much more confident and comfortable in a longer sleeve, and they’re easier to layer under a cardigan or coat without rolling up. This color combination would be cute for a casual Valentine’s Day date. *cue the hallelujah chorus* This was the other item that I was most excited for, and it is so perfect. Perfect fit, perfectly oversized, perfectly casual, but perfectly capable of completing an outfit for a more put-together look. And, it’s so soft and warm. Again, PERFECT. This is going to get so much wear. I already have my eye on the olive green. 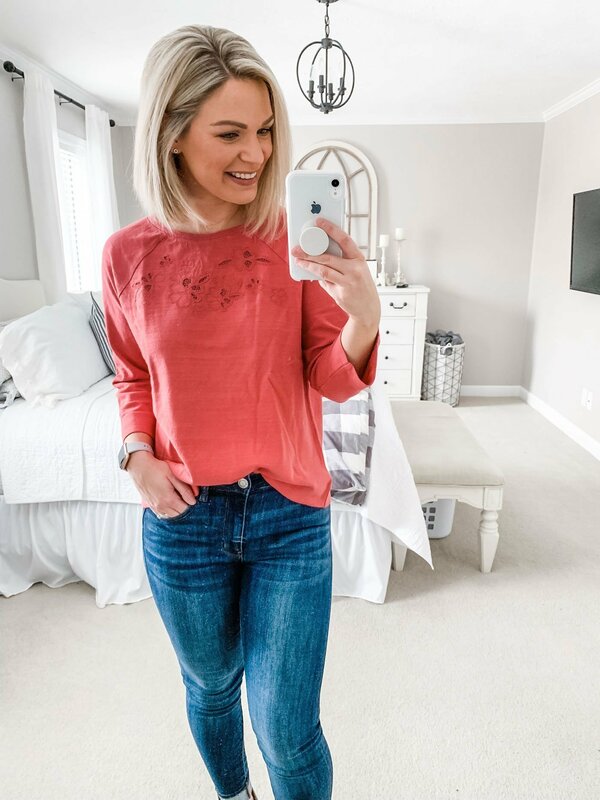 Everyone seems to shop at and love Loft – what new finds have you come across recently? 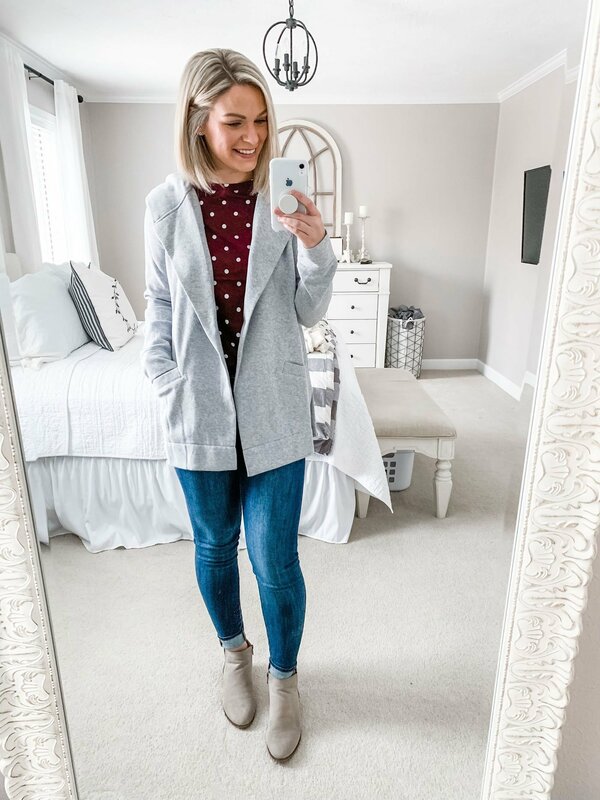 More shopping and style posts here! I seriously love every single item you purchased! So cute! Both the coral and burgundy shade look great on you! i pretty much do all of my shopping online and i live like, less than a mile from a mall haha. i just prefer it. it’s been a long time since i ordered anything from loft because i had too many misses instead of hits and just gave up. 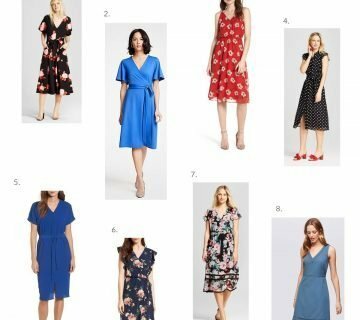 but all of these items are so cute, and i love that you’re adding colour into your closet – i definitely struggle with that! Haha, I don’t blame you. I always tell Ryan that I can’t wait until we live closer to “real” shopping, but then I laugh because I’d probably still do most online! 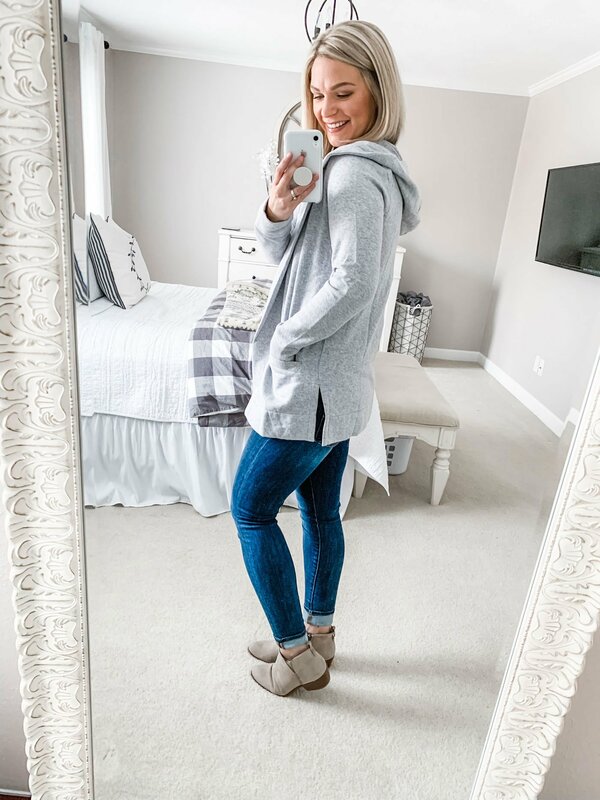 Loft is super hit or miss for me, too – the sizing can be all over the place, so I was shocked that all of this worked for me. And, yes to color! I’m the exact same way! It’s very hit or miss for me; I actually had been in the store twice last month and came out with nothing. Sometimes I believe their online selection is better! you have great style! cute looks! Such cute clothes! Thank goodness for online shopping with the horrible cold we’re having! No kidding! Thanks for the gift card so I could shop! It’s sooo cold and there is so much snow! You look so cute in all of these. Love that open cardigan thing! So cute! The cold and snow is just ridiculous – it’s 20 degrees today and that feels like a heat wave, ha! That cardigan is my new favorite thing in my closet. It’s just perfect! That coral sweatshirt looks so great! It’s the prettiest color – I can’t wait to wear it once the weather warms up. Haha, I’m glad someone else can appreciate how perfect it is! Thanks, girl! It is seriously so comfy and warm!